For six years, Katy was the volunteer director of the summer reading program for Gatewood Elementary in Hopkins Schools. ​In the spring, every Gatewood Elementary student is invited to participate in Book Buddies, our summer reading program. Based on next year's grade level, students select one book from each category, reading five books total over the summer. As always, students participating in the Book Buddies program will have a fun get-together in the fall to discuss the books they read over the summer. Each student who signed up in the spring will receive a personal invitation to the party for their grade level. Each year, a Google Slide Presentation is put together to help students decide which books they'd like to read. In addition to images of the book covers and descriptions, there are links to videos of previews and author interviews as well as links to Websites where students and families can learn more about the books. The summer reading program has been a staple offering at Gatewood for years. When Gifted & Talented educator Sarah Ham retired in 2011, Gator mom Katy Tessman couldn’t let the program discontinue. She has been spearheading the summer program ever since. Gatewood Book Buddies: Summer Reading Program fosters love of reading at any age. The start of the 2017-18 school year signaled the end of the Book Buddies summer reading program, but the fun of reading for Gatewood students is just beginning. ​​​Armstrong High School Media Center: From library to student union: Armstrong students thrive in transformed media center One of the goals to the media transformation was to cater to students’ strengths, whether it’s technology, video, or music. As part of the new Tiny Desk Concert program, Armstrong sophomore Jessa “Kat” Hanson works on a song with Katy Tessman, media clerk. Katy has led several book groups. 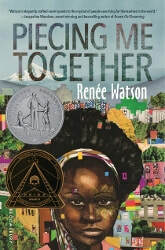 Some titles include "Percy Jackson and the Lightning Thief" by Rick Roirdan, "Harry Potter and the Sorcerer's Stone" by J.K. Rowling, and "Piecing Me Together" by Renee Watson. Read the first two chapters of the book, watch a short video on YouTube of Yoda's words of wisdom from the Star Wars movies, and eat Cheetos. ​Make origami fortune tellers, with words of wisdom from Yoda inside. Read the chapter about Shakespeare's head; discuss the similarities between the author from long ago and the fictional futuristic character. Each student used a tub of play-doh to sculpt their very own bust of William or Yoda (their choice). Make the 5-fold origami Yoda.